Matthews and gang forge on under Comcast. 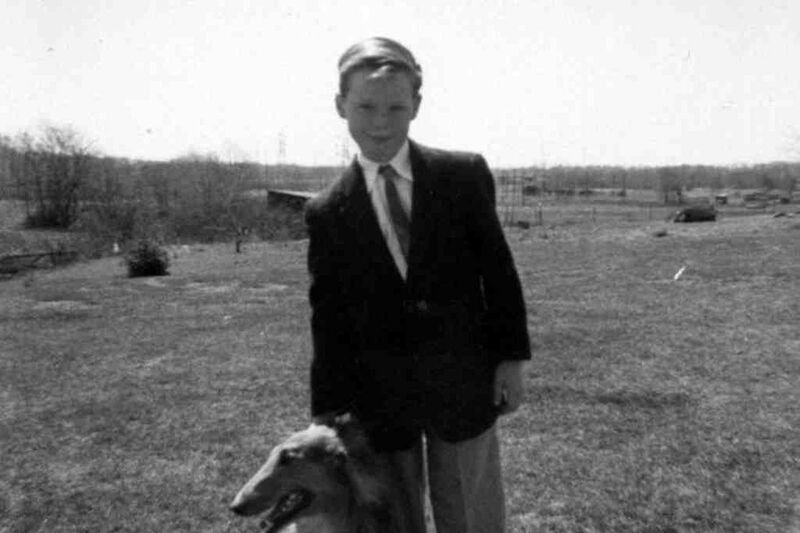 A young Chris Matthews in Northeast Phila. He and his brother's political differences make for lively talk at family gatherings. anchor Chris Matthews, now an employee of the rebooted Comcast Corp. - a newer, flashier, more ratings-driven cable giant. One day last week, Japan was in the headlines with its post-tsunami nuclear crisis, and Sarah Palin was visiting Israel. "What phony baloney," MSNBC host Matthews cracked during his afternoon editorial meeting about the former Alaska governor's trip. A no-fly zone was being enforced in Libya. "I know everybody hates the idea, but you need to give a rat a place to go," Matthews said of Moammar Gadhafi's possible exit strategy. He spoke in his rapid-fire Philly-style delivery to a group including his executive producer, patched in by speakerphone from 30 Rock in New York. Everyone laughed. Seven weeks after Philadelphia-based Comcast officially assumed control of the prized NBC Universal Inc. from General Electric Co., the sky hasn't fallen at the news and entertainment company. During visits to Rockefeller Center and the bureau here, there was a sense that Comcast has a plan - or is hard at work on one - to rebuild the Peacock brand, and that the new ownership would likely benefit NBC in a rapidly changing media landscape, where the mass audience is fragmenting via tens of millions of iPads, smartphones, e-tablets, and the ever-expanding Internet. "We are now working for a company that's selling our content to the home," said Matthews, an often-repeated view at NBC. "They can help us. Before, we were working for a company that manufactured aircraft engines and lightbulbs." That is not to say there is not some apprehension. "It's very business-oriented," Matthews later observed confidentially. "These guys, I understand, are very IBM-ish." In the depths of the recent economic downturn, Comcast bought NBC Universal from General Electric - which still owns 49 percent of the company - primarily for its profitable cable networks, led by USA, and the potential to rebuild the NBC broadcast-TV business. A property such as MSNBC seems to offer both potential gain and risk. For years a flailing cable news channel, MSNBC - which shares office and newsroom space with the NBC News broadcast team - currently offers a left-leaning slate of prime-time hosts that counterbalances Fox News' conservative talkers. Fox still can pummel MSNBC and CNN in prime time. But MSNBC has been steadily gaining on, and many nights beating, CNN, particularly when there are no major international news events pulling viewers to the CNN brand. Last Monday evening, with the Japanese nuclear crisis, Palin's Israel trip, and Libya, Matthews' Hardball drew 784,000 viewers in his 7 p.m. slot, compared with 927,000 for CNN and 2 million for Fox News, MSNBC said. But January and February, two crisis-free months except for the Egyptian revolt, were different stories. Hardball drew an average viewership of 735,000 at 7 p.m. in February compared with 560,000 for CNN, according to MSNBC's research department, which uses Nielsen Co. data. In January, Hardball had an average of 726,000 viewers a night, while CNN had 437,000. CNN did not return a phone call to speak about the ratings. Its newfound ratings muscle hasn't translated - at least not yet - into bigger money for MSNBC. Cable and satellite-TV distributors pay about 17 cents per subscriber to carry the network. By contrast, they pay 51 cents per subscriber for CNN and 70 cents per subscriber for Fox News, according to the research firm SNL Kagan. CNN, part of Time Warner Inc., charges a premium for advertising because of its high-profile brand and had revenue of $1.2 billion and cash flow of $541.6 million in 2010, SNL Kagan said. Fox News had revenue of $1.5 billion and cash flow of $816 million. MSNBC trailed with revenue of $378.6 million and cash flow of $168.8 million. "What's motivating us now is: How do we close that entitlement gap?" said Steve Capus, president of NBC News. He reports to former Comcast executive Steve Burke, who was installed as head of NBC Universal. Capus said that Comcast "would like to see us run our business," and that its officials typically end meetings with him saying, "What can we do to help?" MSNBC president Phil Griffin said it had been a long climb to respectability for the 24-hour network, launched in the mid-1990s as a joint venture between Microsoft Corp. and NBC. "Don't empty the stadium" is the phrase they use at MSNBC, Griffin said - in other words, don't insert a host into a prime-time slot who would lead viewers to switch channels. What has helped MSNBC's ratings, Griffin said he believed, is the smooth flow of hosts that begins with Matthews at 7 p.m., then continues with Lawrence O'Donnell at 8, Rachel Maddow at 9, and Ed Schultz at 10. "I want to make up ground with Fox News. That's the goal," said Griffin, who thinks the economics of MSNBC will catch up with the reality of higher viewership. "We have beaten CNN, and we are a solid No. 2. . . . Fox is now in our vision, and there are a couple of hours where it's getting close." When Comcast announced its intention to buy control of NBC Universal in late 2009, some noted that the deal would bring together two Philadelphia icons: Comcast and comedian Tina Fey, an Upper Darby native. Matthews may not have Fey's star power, but he has deep Philadelphia roots. Raised in Somerton, young Chris developed a passion for politics listening to his maternal grandfather, Charles Patrick Shields, who was a Nicetown committeeman for decades. Some of the stories were about how the new Democrats were challenging the old Republican guard in City Hall. Other conversations were about "jobs and the city going downhill," said Matthews' brother, James, the Republican chairman of the Montgomery County commissioners and a 2006 candidate for Pennsylvania lieutenant governor. Added Jim Matthews ruefully: "Nothing's changed." The brothers diverged politically as adults, and that makes for lively conversation when they gather for Christmas each year at Jim Matthews' house in Lower Gwynedd. "It's a huge crowd," said Chris Matthews. "It keeps the cousins together. Some of the cousins." Chris Matthews and his wife, Kathleen, have three children. Son Michael and his wife, Sarah, live in Philadelphia's Washington Square area. Son Thomas lives in Los Angeles. Caroline attends the University of Pennsylvania, majoring in history and French; she finishes this year. As Matthews spoke in his third-floor corner office, incoming e-mail beeped on his computer. It was his daughter with a proposed schedule of events for her graduation celebration. Matthews said he didn't know Comcast's ruling Roberts family. He met cofounder Ralph Roberts once, at a fund-raiser for Hunting Park. "The only guy I know really well is David," he said. That would be David Cohen, a political insider in Washington and Pennsylvania. Now executive vice president at Comcast, Cohen was chief of staff for Ed Rendell - whom Matthews referred to as "Eddy" - when he was mayor of Philadelphia. In person, Matthews looks taller than he does on TV, and youthful for his age - he's 65. He's now one of the nation's longest-serving cable news hosts. "Larry [King] is the only one who would have beat me. And he's gone. I don't think of myself in that way anyway," he said. "I'm so energized."